CONTESSA BREWER: Well, you've heard of Jihad Jane, now meet Jihad Jamie. Another American woman linked to a terrorist group over the weekend. Jamie Paulin-Ramirez, a 31 year old Colorado nursing student was detained but then released in Ireland. She was questioned in connection with a plot to kill a Swedish cartoonist who drew a picture of the Prophet Mohammad as a dog. Ramirez's arrest comes after Pennsylvania's Colleen LaRose was named in an indictment in the same plot. Her mother says she's surprised by the allegations against her daughter. CHRISTINE MOTT: She was always a good kid. She was going to college, working full time. She walked out on her job with no word. She became very secretive. Wouldn't give out any information about anything. 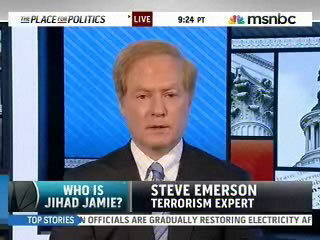 BREWER: Joining me now is terrorism expert Steve Emerson. Is this the new way to recruit terrorists, look for American women who are willing to convert to jihad? STEVEN EMERSON: Looking for American women or men; those who carry American passports and can travel around the world without engendering suspicion. Traditionally law enforcement has used different techniques. Profiling, wiretaps, they've used leads they got from the public. Now they're doing something else. They're using the cyber investigation because both women left an electronic signature on the web that was very easily detected by law enforcement because they both talked about jihad on the web and how they were committed to carrying it out. BREWER: And this woman, Steve, the woman that we're showing, Jamie Paulin-Ramirez was actually brought to the attention of authorities by her stepfather. He was concerned about her conversion to Islam. Thought she was becoming radicalized and actually turned over her computer to the FBI. So now the Irish police have released her without charges and the family says they have no idea where she is or where their six year old grandson is. Would Irish police for sure keep an eye on her? EMERSON: Yeah, I think they would. I think they released her but I don't think they released her entirely. I don't think she's free to leave the country. The Irish government has different laws regarding how it handles prosecutions and sometimes it releases suspects only to recharge them weeks later. Certainly, based on what we know now, she was involved with a man named Ali who she thought she was going to marry and she volunteered for the jihad and as her parents said she was increasingly radical, including radicalizing her son who began inveighing against Christians so that gave the extent of how much she had become a radical convert. BREWER: Alright, Steve, good to talk to you. I know you're keeping an eye on these cases and we appreciate that.